Riparian areas – the strip of land on either side of a river – are an important element of healthy rivers. They provide essential habitats for wildlife while also acting as buffers between upland areas and open water. Having the correct plants in place assists in filtering pollutants from the water and provides a barrier to erosion. The shade afforded by the vegetation helps to reduce water temperatures which, in turn, leads to better oxygen levels to support aquatic animals. 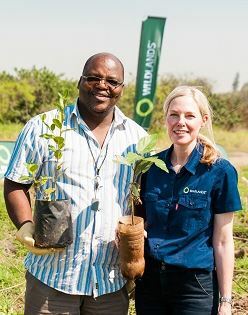 Bongani Gumede, Tongaat Hulett Developments Corporate Director is pictures holding an indigenous tree that was planted at Cornubia with Louise Duys, Wildlands Director of Partnership, Marketing and Events. Considering the 9.2km length of the river, and the fact that the riparian zone can extend anywhere from 10m to 100m from the riverbank, this is certainly a considerable undertaking. The rehabilitation began on Arbour Day 2014 and thus far some 54 ha of initial clearing and 51 ha follow-up clearing of sometimes very dense bush have been effected. “Tongaat Hulett is serious about harnessing the capacity of the local community and about creating a sustainable ecosystem as well as social environment,” concludes Gumede. “We are rolling out a programme of training and skills development that will be to the advantage of both the biosphere and the community. This is only the beginning of a far larger undertaking.